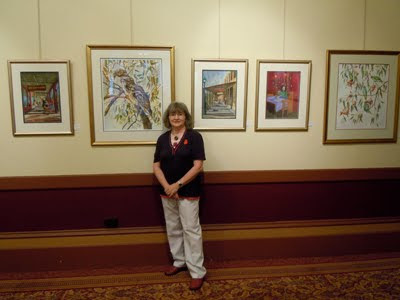 THE CAPITAL - I quick pic of me standing in front of a few of my paintings at the beautiful Capital Theatre in View Street, Bendigo. The Tawny Frogmouth Trio was a feature piece, a large watercolour ($1,695.00) and is now available on Limited Edition Prints- A3 size @ $120.00 each -mounted/unframed. Many paintings from this exhibition are still available, come to the studio to have a peep. Please phone first to make a time - thank you.